What are Cushion Cut jewels? "Cushion cut" is a term you're probably noticing more and more lately, if you're into jewelry and gems and do it yourself jewelry! It's one of the most popular shapes in glass stones (and precious gemstones too). The 15x10mm diamond shape is a terrific size for earring drops - large enough to have style and presence but still comfy. And for pendants? Perfect. Feminine. Affordable. It's just nice to be able to make a pretty necklace or pair of earrings for your August birthday girl - without a ton of work or spending a lot of money. Peridot green is the birthstone color for August (but you knew that). And these are fabulous for earrings! Of course the idea is to make easy DIY jewelry using birthstone colors - but really, peridot is such a friendly and happy color, I'll grab any excuse to use it. Because it's pretty. And fun. And isn't that a good reason? 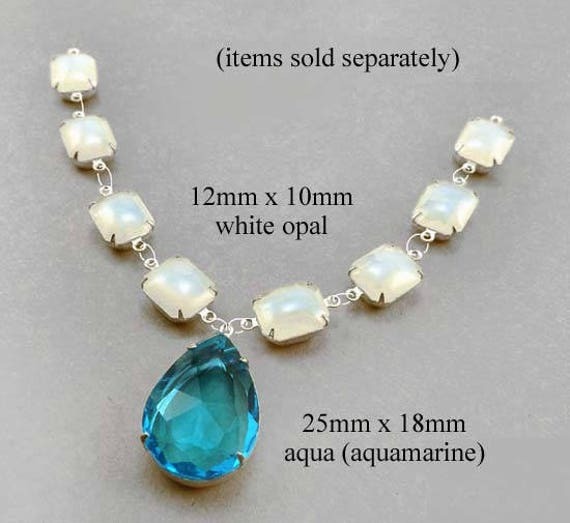 In this necklace design, the "chain" is made with white opal vintage glass connectors. Your focal pendant can be personalized for the customer - in this example, the March birthstone color aqua is used. Run with it! Making jewelry for a bride is one of the most satisfying, creative jobs we jewelry-makers can get! Working with beautiful beads and jewels - for a customer who is in love and wants her jewelry to reflect that - what could be more happy-making? Of course there will be a zillion different designs, styles, colors and materials your bride may want. But sparkling crystal stones are classic for a bride - and you can see why. What do you want for your own wedding jewelry? This offer is good for July 7, 2017. Buy one pair of the aqua cushion cut octagons shown in the listing linked above, and you get a second pair free!